Plastic is everywhere: food, packaging, clothing, toys, kitchen, etc. It is hard to believe that something we love and have simplified our lives so much turned out to be so damaging to the environment and potentially harmful to our health. As time goes by, more and more scientists and research organizations say that plastic should not be assumed to be safe. 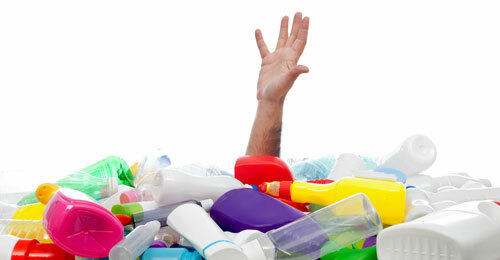 In fact, toxins from plastic bottles and containers can leach into food and drinks, posing a serious health risk. And even more seriously when used to heat food in the microwave. The worst concern is bisphenol-A or BPA, which has been linked to cancer, infertility, obesity and even early puberty in animal studies. It is alarming to learn that a CDC study found this chemical in 93% of people tested. BPA has also been found inside metal food and soda cans. Play it safe and do not heat anything with plastic in the microwave — use glass or microwave safe ceramics. If you must use plastic anywhere else, stay with the “safer” plastics, which are numbered #1, 2, 4 and 5, and avoid #3, 6 and 7.